What’s a hockey fan to do with all these extra hours of daylight? Play street hockey all day, of course! 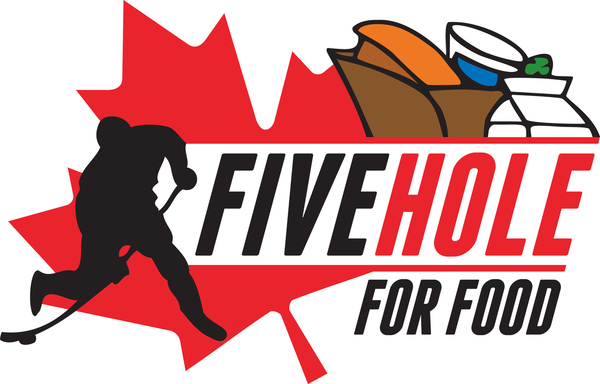 Five Hole For Food is coming to Edmonton tomorrow. They’re a non-profit organization that raises awareness and collects donations for local food banks across Canada. Time: 3 p.m. – 8 p.m.
Bring a hockey stick and a donation for Edmonton’s Food Bank. Five Hole For Food is hoping to reach a grand total of 1 millions pounds raised by the end of this trip… for any of you with a competitive streak. I’ll see you there! p.s. I MIGHT come out of retirement and put on the pads tomorrow! The photo is indeed correct. 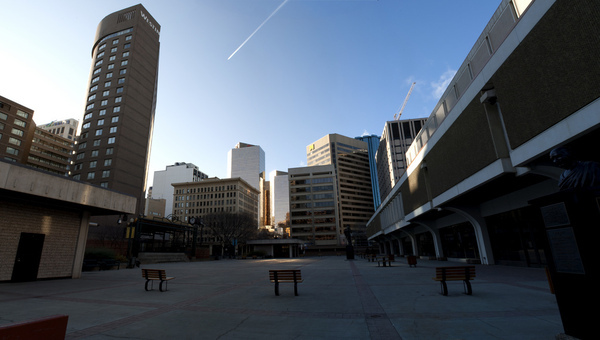 You can see the Westin in the photo which is taken from the Citadel Theatre side of the plaza. Jen, are you a better goalie than Fasth? A Ben/Jen tandem could be the key to the cup. You guys know she is married right? LONG LIVE THE FIRST LADY! I actually updated the photo. Glenn was right so I fixed it. B-B-B-Benny-in-the-nets is a lucky man, Jen! Creating awareness and giving back to the community. That’s what makes The Nation & The First Lady so awesome! Keep it up! It’s Mrs. Scrivvvves!! Internet hugs and high fives shall abound! Can opposing goalies duke it out at center court, before the game starts? A brief reminder that intimidation can still alter performance. Beating some of you sorry sons a biotches would just be a bonus. Losers (including all spares) remains will be converted into Soylent Green, which would be our donation to this very worthwhile cause. Mrs. Scrivens, there are just alot of things to like about you. For a Cali girl, it would be easy to just be a diva and complain about the lack of highend fashion shops in Edmonton. You are making the most of your situation and making a difference.